At the D23 Expo, Pixar surprised attendees with a screening of the first half of its upcoming television special, Toy Story of Terror, which will air on ABC in October. The preview confirmed that the special would be a send-up of the horror genre, but would also pack in plenty of laughs and heart. A commercial has just been released, providing those who were unable to make it to the Expo their first look at the groundbreaking project. After the break, check out the commercial and a brand new still featuring Mr. Pricklepants and others from the lovable cast of toys! 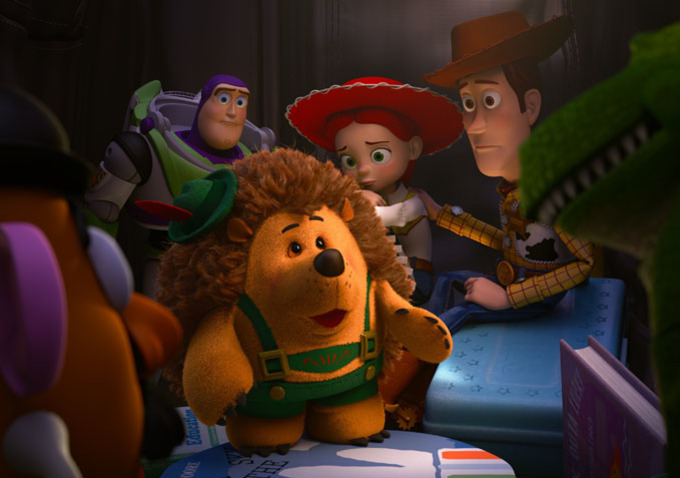 HuffPost TV debuted the 30-second commercial for the special, which reunites cast members from the Toy Story franchise, including Tom Hanks, Tim Allen, Joan Cusack, and Timothy Dalton. It is great that Pixar is able to continue working with the original cast, especially given how connected the actors are to their characters. Personalities like Hanks are in-demand, and seeing them continue to collaborate with the studio deepens the respect that Pixar has earned in the industry. Since there will not be a Pixar feature film in 2014 and we do not know when the next Pixar short or television special will see the light of day, Toy Story of Terror may be the last project we see from the studio for quite a long while. Set your TiVos and DVRs to record so you can fill that empty space with repeat viewings of the special. Toy Story of Terror airs October 16th on ABC at 8:00 pm ET.